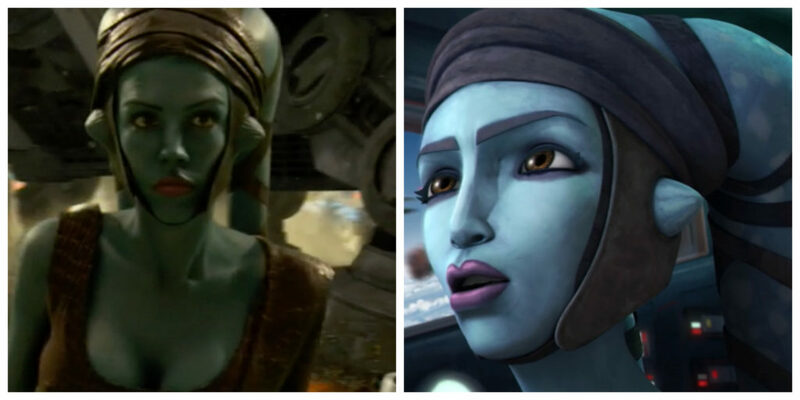 Aayla Secura in Revenge of the Sith (left) and The Clone Wars (right). Aayla Secura was a Jedi Master who fought in the Battle of Geonosis and was a General of the Grand Army of the Republic during the Clone Wars. She appeared in Attack of the Clones, The Clone Wars TV series, Revenge of the Sith, and the comics Darth Maul-Son of Dathomir, Part Three and Kanan 2: The Last Padawan, Part II: Flight. Artist Jan Duursema and writer John Ostrander created Aayla Secura for the Star Wars: Republic comic series (which is now Legends). Other Legends productions Secura appeared in include the Dark Horse Star Wars comic, two chapters of the Legends Clone Wars TV series, and the comic Jedi: Aayla Secura. Here’s a bit more about Secura’s story from Star Wars Explained.